I was not sure whether to stay in Santiago or not for a while. But then I got a good opportunity to improve my Spanish a bit. Furthermore, I had some books which I wanted to read and books we were writing together with my friend Mine Poge. I thought “If I stay in Santiago I can l do all these” and decided to stay. 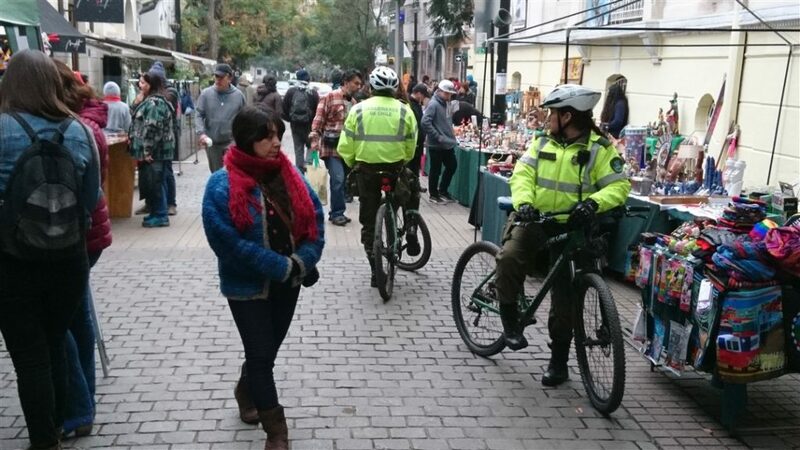 I had come to Santiago a year ago and stayed for 20 days. That is, I can say that I know this city. Even I don’t like cities, I do like this city. On top of the list why I like this city comes the 274 km long bicycle lanes. In 2005 the governmental decision was as: Bicycle lanes are to be built in every town and villages. 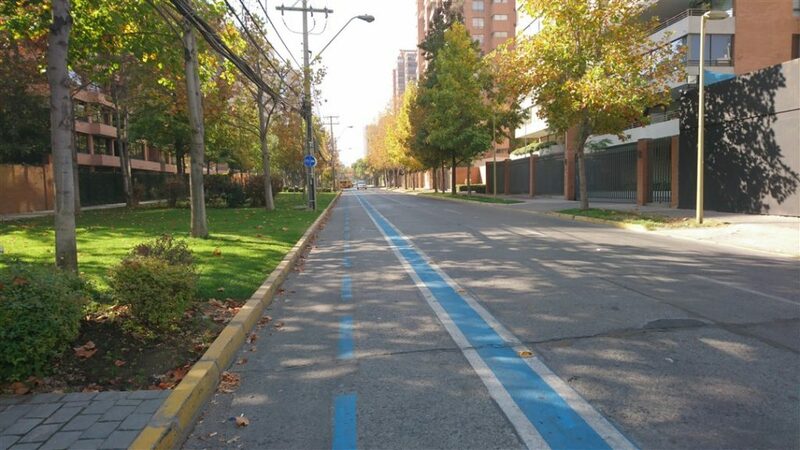 During my travel in 2017 from Santiago to Punto Arenas in Chile (that is from the tip to the toe of the country) I saw bicycle lanes in every village and town. Those lanes aren’t nonfunctional. Those well constructed lanes with appropriate lighting systems are substantially contributing to the transport system of the town. I suppose also education related to this subject is given in the schools. But the city Santiago differs from all the other towns. It is impossible to see 274 km long bicycle lanes even in the capital towns of European countries. 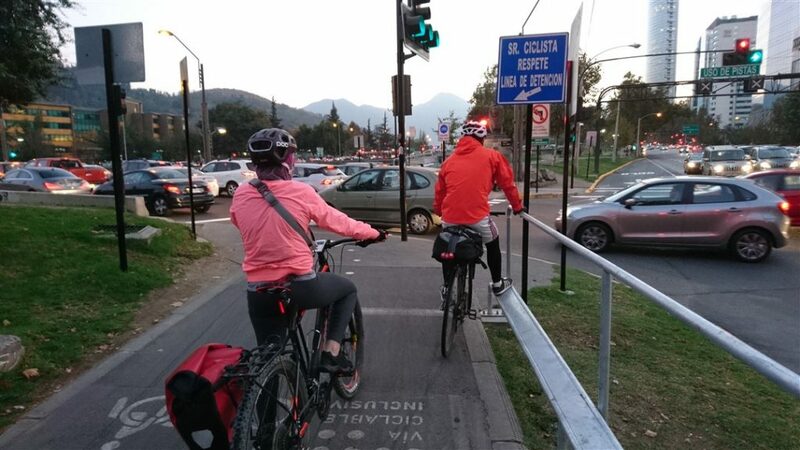 According to a research done in 2018, it was estimated that more than a million of people were cycling per day in Santiago. 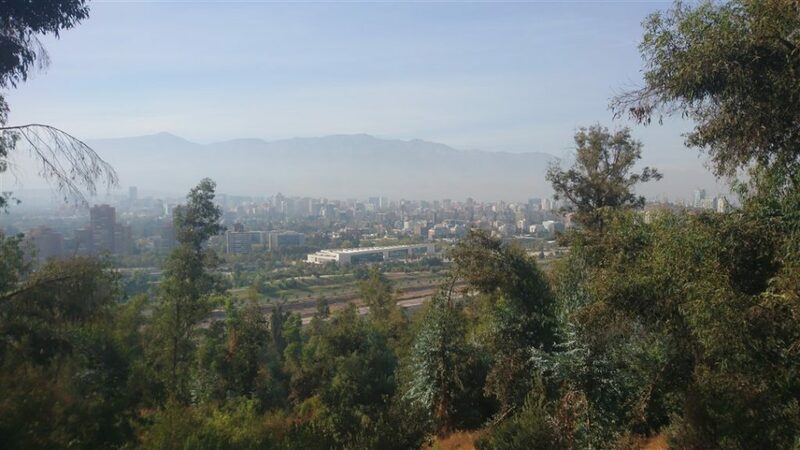 The population of Santiago is over 6 million. The amount of people using bicycle for transportation has increased from year to year and is continuing to increase. This increase also had an impact on the bicycle industry. Also, the number of people making use of health services dropped down with increasing use of bicycle. This was also the case in Santiago. 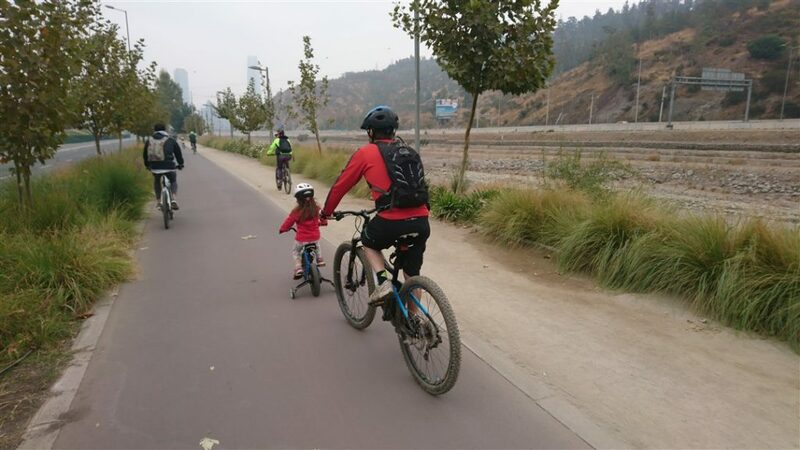 After observing the impact of bicycle transportation on the economics of the country, better measures were undertaken on the issue of bicycle transportation. Additional lanes and nice details were added while waiting at red light. The ratio of bicycle dealers had increased depending on route. There are exactly 21 legal provisions related to bicycle. I examined every single provision. If I’m not wrong, there are only 2 legal provisions in the highway code related to this issue in Turkey. It is obvious that this requires long term vision. But I believe that with vision holder municipal authorities and ministers of transportation such measures can be taken in countries having the necessary resources. 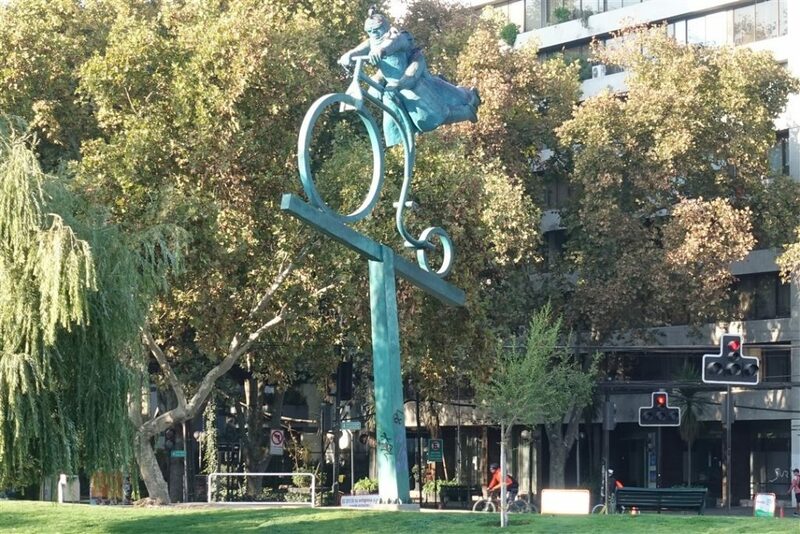 As you know there are shared bicycle systems in many cities where you take a bicycle from a bike station and then bring back. 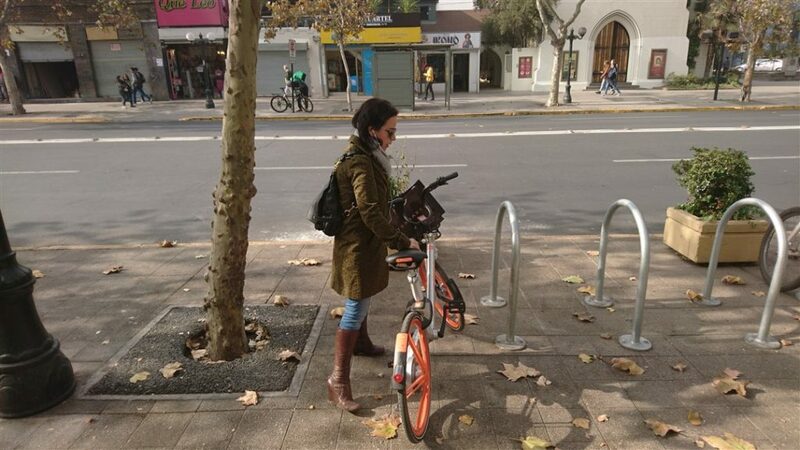 The Mobike system which started worldwide in 2018 was also used in this country. Bicycles are rented via a mobile phone app from anywhere and left where ever you want (In April 2018 this application was only used in the campuses of one or two universities in Turkey and efforts were taken to spread in Istanbul). This system works quite well. You find a bike nearby from the map displayed on the app. Finding your bike, you unlock it by scanning the QR code on the lock that is attached to the handlebar which takes only 5 seconds. You ride to the destination you want to go. Meanwhile, the app tracks you via GPS. You can see how many km you have ridden, how much calories you have burnt during your ride. At your destination you leave your bike at an appropriate point, the lock system on the rear wheel locks the tire and you’re good to go. The system takes the payment from your credit card automatically. Well, aren’t there ill minded people tending to misuse the system, there are. 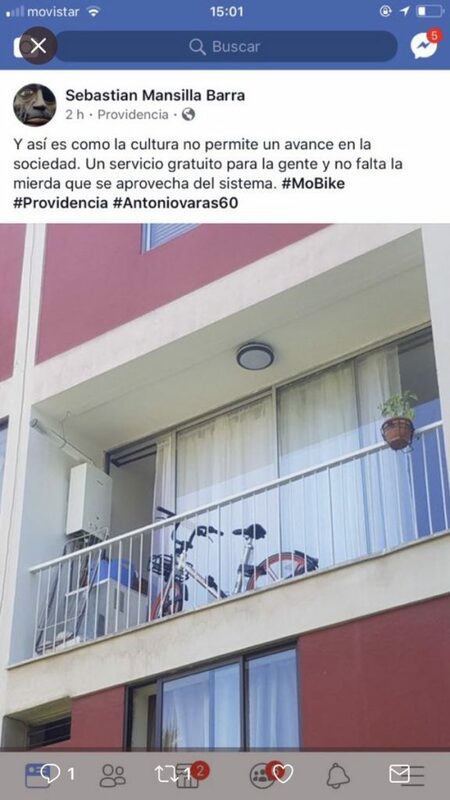 For example, there are people putting the Mobike on their balcony or in their parking garage or taking away inside their car trunk. 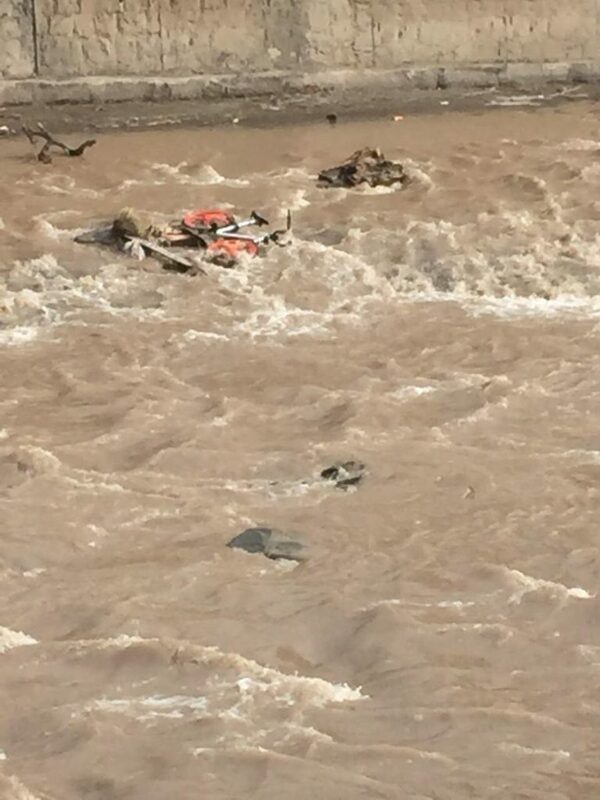 There are people throwing the Mobike in the river. That is, there are wicked creatures everywhere in the world. But just that there are such people we shouldn’t give up doing such things. We are obliged do the things we think to be right for the humanity. For example, another application which I like in this country is related to the vehicles in the traffic. The vehicles with old technology or the ones polluting the air are prohibited to enter the city during some days of the week which directs the people to use public transportation. Well, if you can afford you can by a new car which will result in increase of car sales. I was not so willing to learn Spanish till now. If I really want to learn Spanish, then I would need money for a language course. Since I’m spending my money for my needs on the road, for my projects or for the people who I believe are in need, I never have had saved money. During my stay in South Africa I went to a Spanish course for one month and learned some basic things but then forgot since I didn’t have the opportunity to speak afterwards. All the Spanish courses I checked in Santiago costed between 700 and 1000 USD per month. Well, it is said that Chile would be the last country to learn Spanish in South America also affirmed by the natives. It is said that the whole continent speaks Spanish, but the Chilean speak Chileno. Well, if you know Spanish you understand what they are talking about, but there are so many words only used in this country. It is like Anatolian Turkish and Turkmenistan Turkish. I asked Maria who was giving language lessons to the Turkish Embassy employees for receiving 1 or 2 hours of lesson per week. The money I possess is not much, I cannot afford to pay at once. This was good so, because I could choose to take a lesson or not whenever I want. By this way I could learn some basics of Spanish, at least I can make myself understood a bit. I guess the best way to really learn this language, it is the best to take a 3 month’s course in Bolivia or Peru. 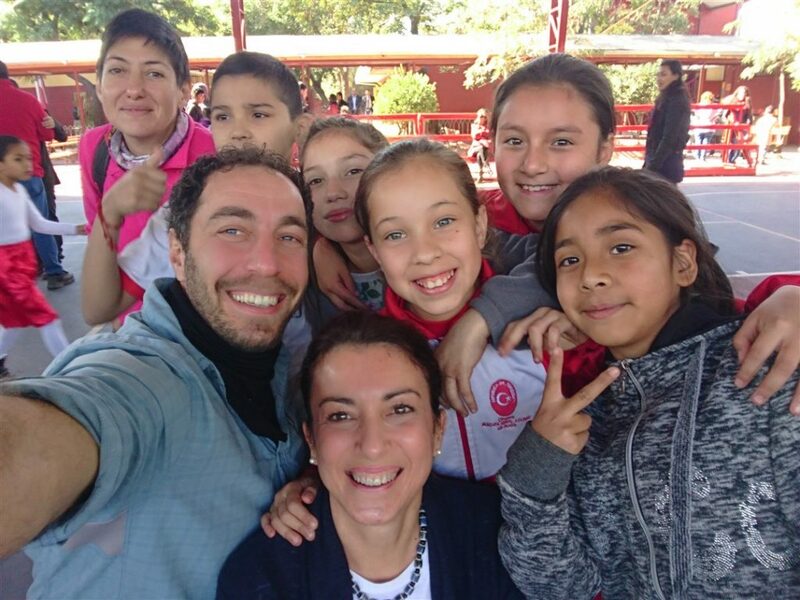 Many of the travelers coming to South America prefer Bolivia, Peru or Guatemala for learning Spanish. Learning Spanish, I also started to learn slang even swear words. Everywhere in the world similar slang words are used. On top of it, both women and men use those unwanted likewise swear words. Well, here are also groups who are against those words to be used. But, I must say that young people keep using slang. Gurkan, Gurkan, do you have a moment for me? Thank you, ones again. This is a small present for you (a buff). I have a question. You see I’m a tiny woman. 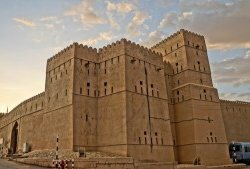 Is it possible to travel likewise for me? After this talk we didn’t see each other or talk for years, neither I knew what she was doing. She had also left Turkey in September 2012 and gone to North America. There she had gathered her gear necessary for bike touring and started on her journey on October 2012. She had started from North America and cycled down to South America slowly. You can find her road memories on www.nuzerel.com , Instagram and Facebook. She writes pretty good. She hasn’t any sponsors. She stops en route, works, saves money and then continues on her tour. Some people following travel blogs generally complain “this digital life, taking adds, online sales, travelling supported by sponsors, all these keeps you away from being a real traveler.” Look at Elif Uzer, she is travelling without any sponsors. Well, doesn’t she want to be supported by a sponsor? Of course, she wants but there aren’t any. She is the only Turkish woman traveling that far and long on bike yet. We have met in Santiago. 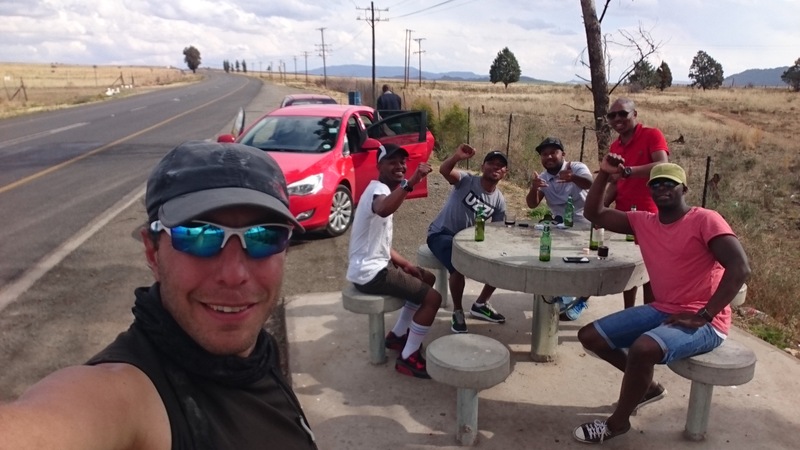 Chatted and chatted… We are cooking our meals together at each other’s place and afterwards go on short bicycle tours. We may start ride together towards Bolivia in September 2018, who knows. One day I called Elif and said: “We are going to Turco Bomberos”. I had visited Turco Bomberos when I came to Santiago a year ago. 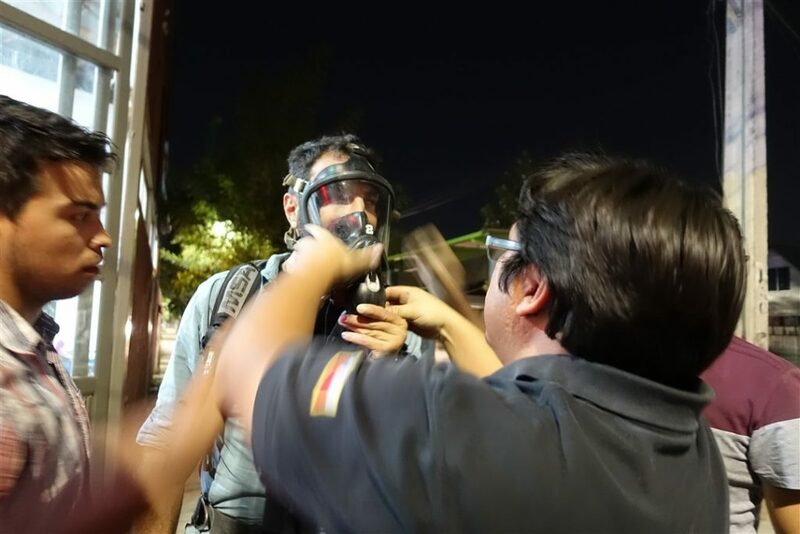 At that time, they asked for support: Receiving training for their firemen and a vehicle. 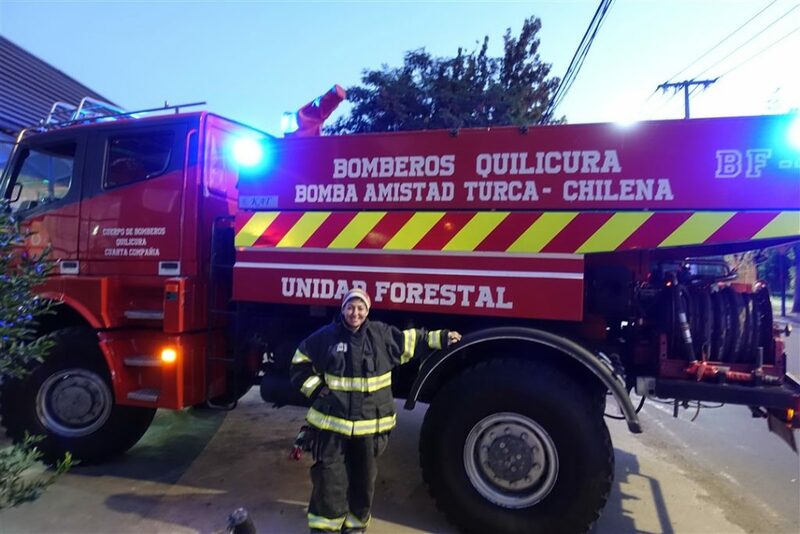 One of the biggest fire outbreaks in South America occurred in 2017 in Chile and relief was sent from all over the world. Unfortunately, from my country no relief had been sent at that time which I had shared on social media. People working at Union of Municipalities of Turkey, TIKA (Turkish Corporation and Coordination Agency) and General Directorate of Forestry were following my posts. 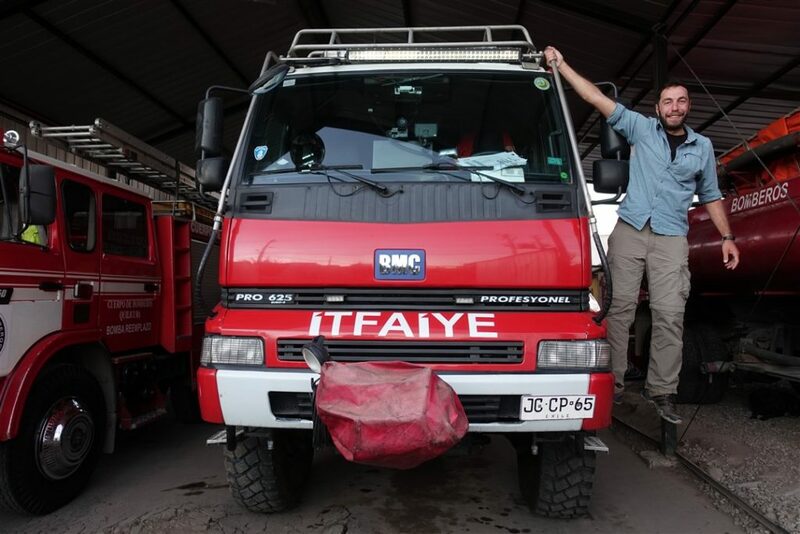 They responded to my post and sent a vehicle to Turco Bomberos in Santiago and trained 4 of the firemen in Turkey. Well honestly, I got surprised, didn’t expect such a response. Back in Santiago they invited me. 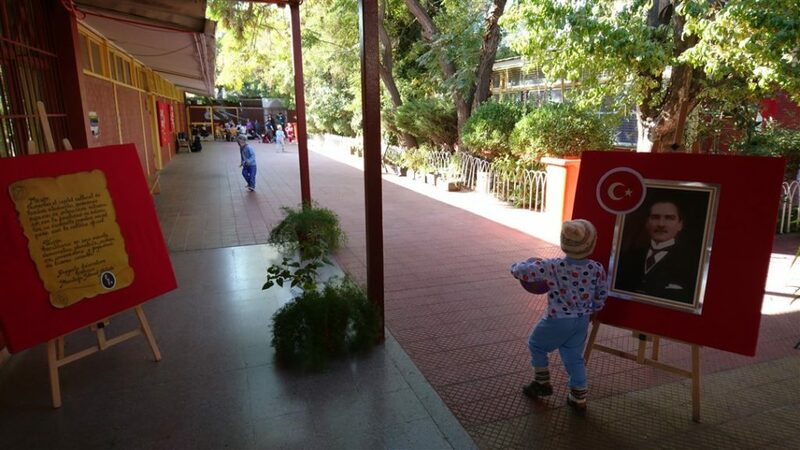 We visited 5 fire stations in Santiago together with Elif. Learned about the exact duty of each station. All stations were possessing appropriate vehicles to go on duty depending on the accidents. They gave us information on various subjects. I had mentioned about the Mustafa Kemal Ataturk high school I visited where I gave a presentation during my former stay in this city. Also, this time I gave a presentation in this school. 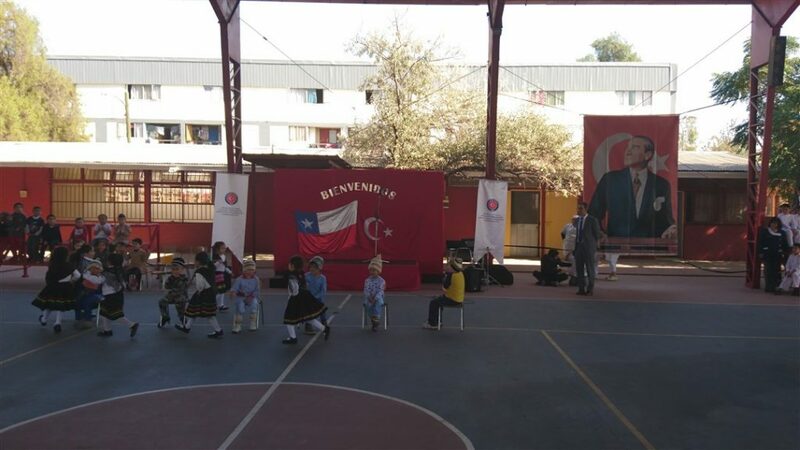 We also celebrated April 23rd National Sovereignty and Children’s Day in this school together with our ambassador, diplomats and students. It seemed as if we were celebrating in Turkey from the photos. Our Santiago ambassador Gulin abla (elderly sister in Turkish) is really an openhearted person and a successful diplomat. She has an enormous energy which she reflects in her work perfectly. All the diplomats in the embassy were respecting her. 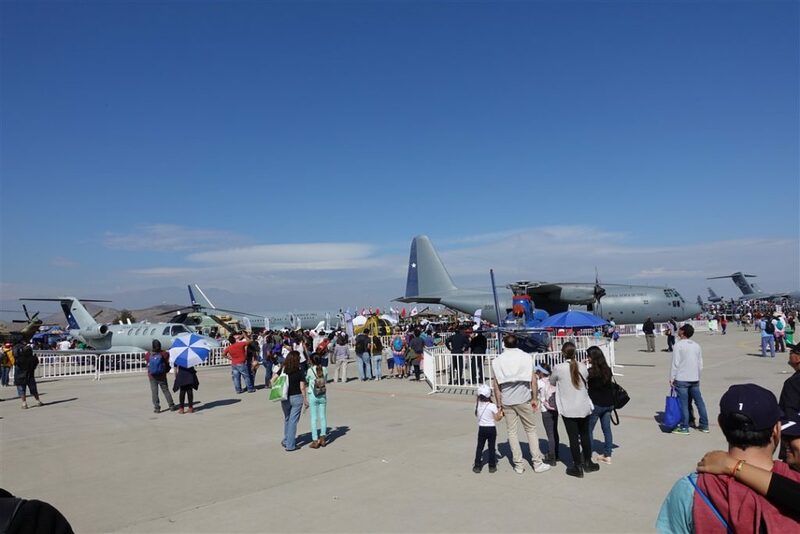 During my stay, Santiago hosted the International Air and Space Defense Fair. Three Turkish companies had attended this fair: Aselsan, Otokar and a branch company of Aselsan producing lithium batteries which name I’ve forgotten. Since I went on weekend during the period open to public, I couldn’t talk to the engineers of Aselsan. They had introduced their products to the customers and had left. To me the representatives of the attending companies should stay till the last day of a fair. Dude, maybe the Minister of Defense of the hosting country or an authorized person will come on public day to visit the fair, you never know. We chatted with the representatives of Otokar. I also got informed about some details why the investment treaty of Altay tank was given to BMC. One of the most important minerals extracted in Chile is lithium. I’m sure that the branch company of Aselsan made important contacts. There was a period when I stayed overnight at the facilities of lithium mines in Chile with USA partnership where I made some observations which I haven’t mentioned in my road memories yet. I’ll talk about this sometime.. 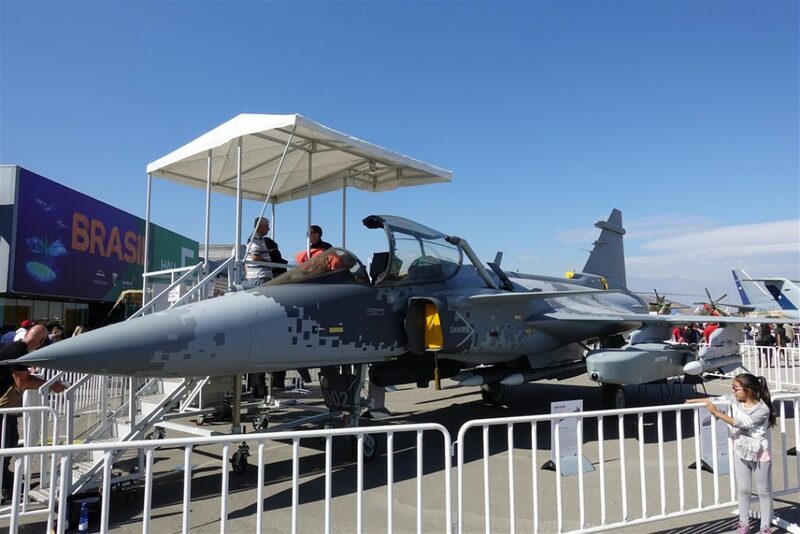 There are tenders won by Turkish Defense Industry in Chile. Anyway, there are other countries but are not mentioned due to some reasons and only people involved in this issue have knowledge. 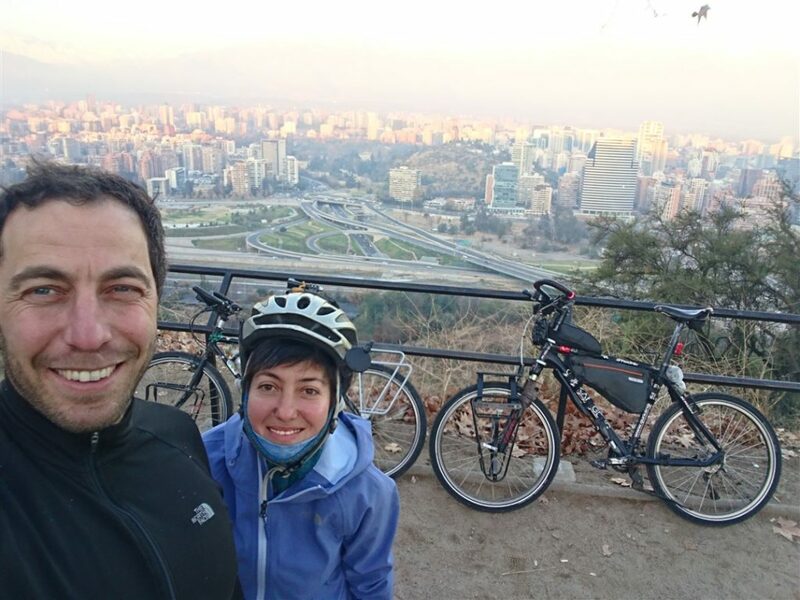 I have mentioned that when I came to Santiago in March 2018, that I decided to stay for a long time since I didn’t have any accommodation problem. My friends knowing my journey, following me for long time were asking: “When will the book be published?”. A touring cyclist I met at an organization in Finland in 2013 gave a good idea. 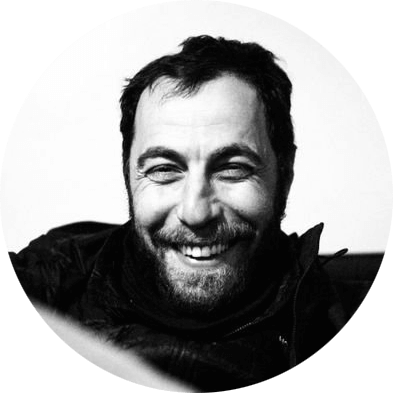 The idea of writing a book beyond a travel book. The books would address both kids and adults. But for this I needed to understand children more. Even, I had to own children. First, we started to work on the books with my cousin. But my cousin told me that she wouldn’t continue and left. So I had put this project aside in 2015. But then in 2017 together with Mine Poge (she is one of my team mates) I re-started this project and in April 2018 we finished all the 4 books. We read them to kids, parents have read them and found out that we really did a good job. We sent them to many publishers. They were offering 6-10 % of selling price to the authors and demanding to dispone our rights of the new books we’ll write within 4-5 years, our publications in other fields or overseas publications to the publisher. In short, we got that there are no rights of an author in this country. People who want to know what kind of a journey I’m doing can read my memories from here. Everybody has access to internet and all the writings here are for free. This the situation, I have postponed publishing the books till I find a suitable publisher or publish with my own money. Well, if one day something unexpected and terrible happens to me on the road, my brother and Mine Poge possess the copies. Don’t worry they’ll publish the books somehow. But I won’t do a damn thing with such minded publishers, while this side of the grave! While days were passing one after the other, chatting on internet with my family I realized that I missed my father for some time. He wasn’t also responding to my calls. I called my brother and asked what happened to my father, where he was. Then I called my mother and asked the same. Getting different answers to the same questions, I realized that something was wrong. I wanted them to explain the situation. It came out that my father was at the hospital, it was exactly the day when the clinical tests were done to find out what was wrong with my father. After a couple of days my mother called me: “Nasopharyngeal cancer with a brain tumor at stage 4 spread to lung due to metastasis”. It was not diagnosed till this stage. While planning to start radiotherapy, due to metastasis it was said that chemotherapy was the only way. The brain tumor was inoperable. The diagnosis was told to my father. Also, the decision to take a chemo was left to my father. He directly said: “I cannot tolerate the pain, I’m already feeling very bad” and lastly “Tell Gurkan not to come back”. I listened to the end and then, hanged up. Mom I return for one or two months. My son your father said: “I don’t want Gurkan to come back”. I hadn’t asked for your permission while setting off, also on road nobody told me where to go or what to do! Saying that I’ll come back, I don’t ask for permission from anyone. I’ll come for two months, share my time with my father and then return continuing on my journey. While he is alive I prefer to come and share time and talk with him. I’m not asking my father whether I should come back or not. See you soon. What would say a father to his son traveling around the world? What would I say as a father? Would I say to my son traveling around the world for the last 6 years facing difficulties, not giving up and standing up after every fall: “I’m deadly ill, come back to see me”? If my father would say this, I would think that he also lost his mind. Since I’m the son of my father, I would also say to my son, “continue on your journey”. I would say this with all my heart and would get upset if he would return. Of course, I don’t want to get my father upset but I want to hug him and thank him once again for all the experiences through which he guided me. In this century, how many fathers encourage his beloved son for such a journey. I only want to share some time with him. For all the years I keep saying that I’m only missing my family. First, I called my sponsors and informed them about the current situation. 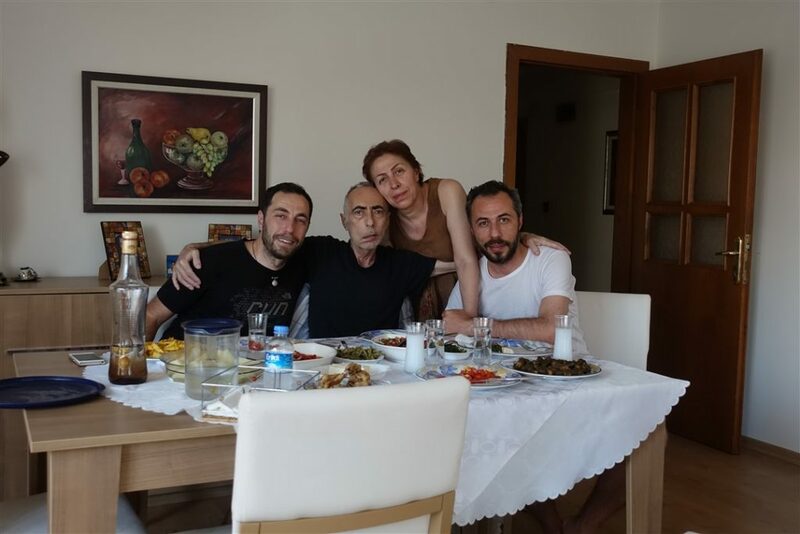 When I talked to Yalcin amca (familiar address to older man in Turkish) the owner of Atilim University, he said: “Don’t buy your flight ticket, I’ll buy for you.” Meanwhile, my close friend Zeynep Koksal hearing that I was returning said: “Gurkan don’t buy your ticket, I’ll buy for you”. Since we had to buy the flight ticket in short time, return ticket’s price cost over 3000 USD. 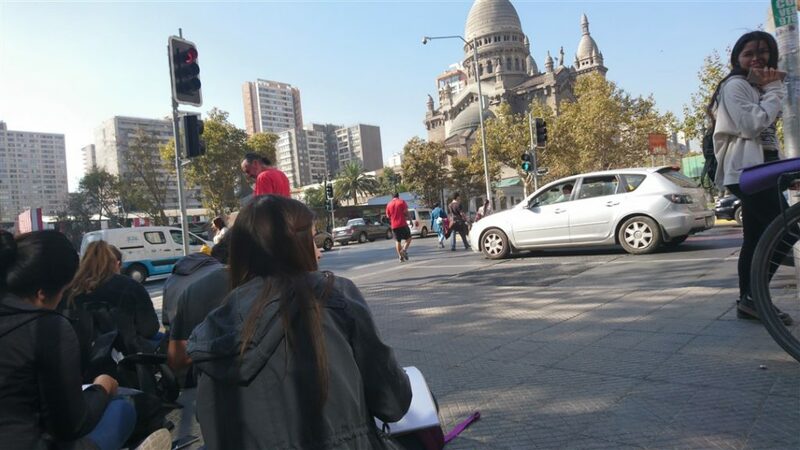 I was settled for three months in Santiago. I called my friends at Turkish Embassy to leave my belongings. I’m not taking anything with me and leave all of them. Then, I set off. 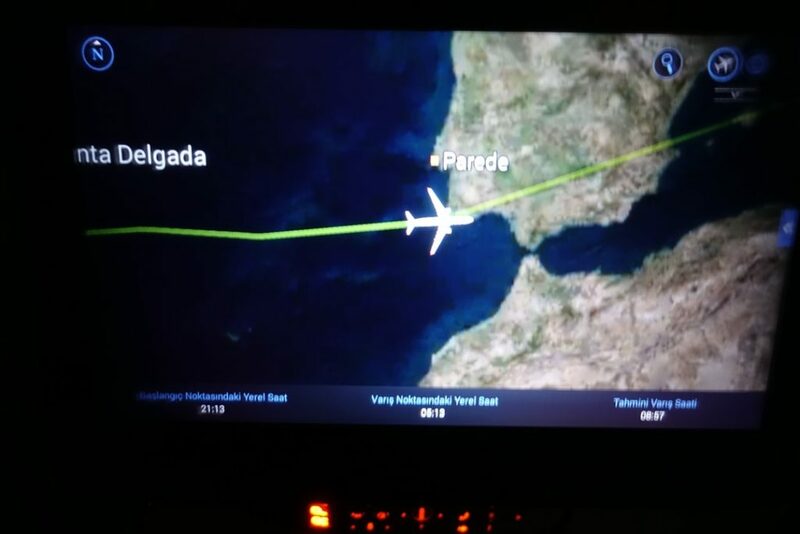 From Santiago to Panama, from there to Istanbul and at last to Ankara, a long flight travel. 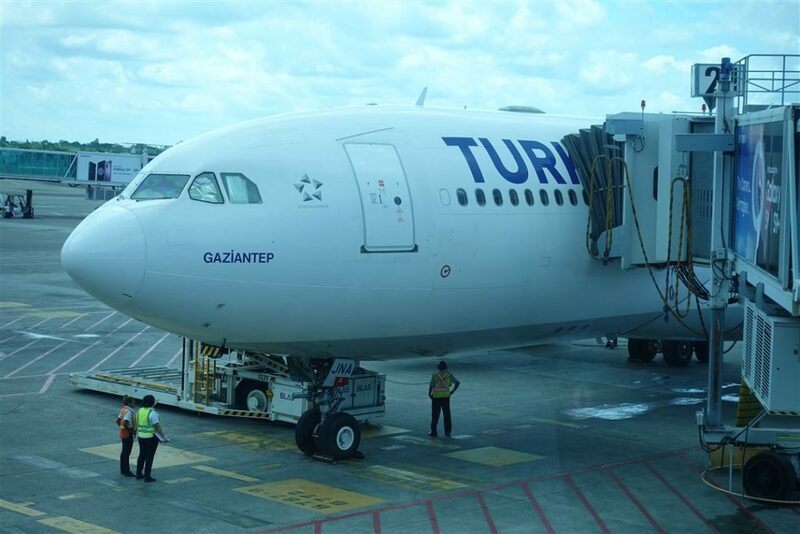 The THY employees in Panama arranged the seats of economy class so that nobody would seat next to me and I returned to Turkey comfortably. 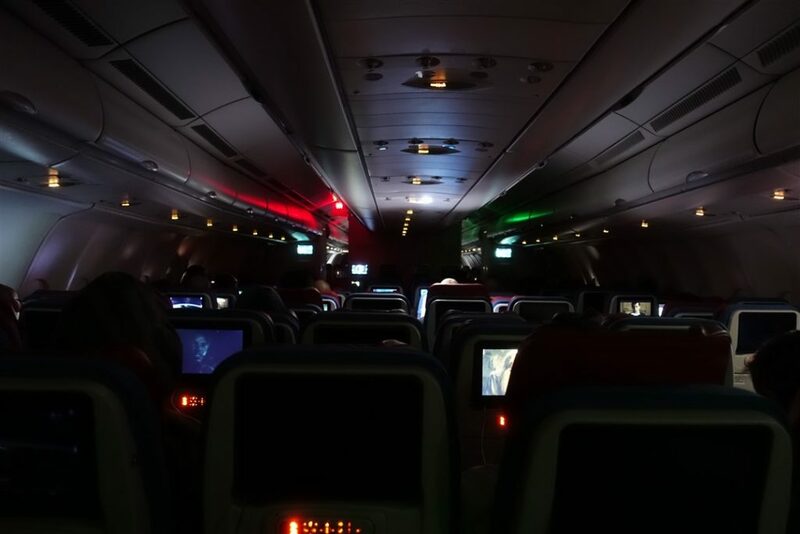 I was the last passenger getting off and it was not easy to leave the airplane… At the airport I had one hour of delay, after 6 years everybody around me was talking Turkish, I watched the people. It was a strange feeling. 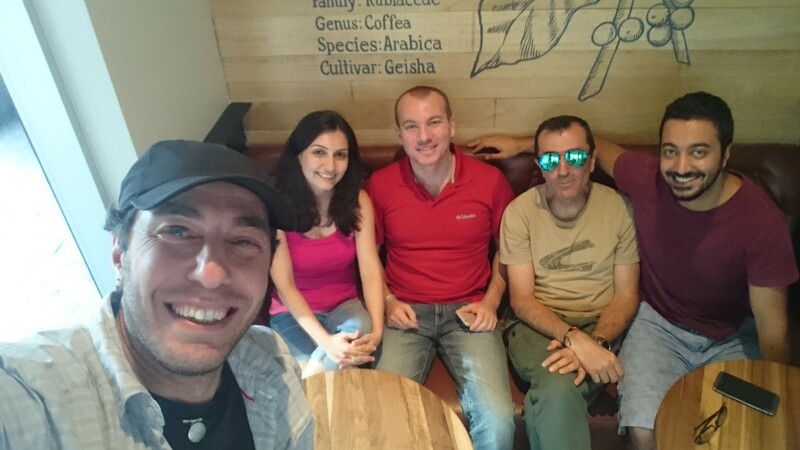 After the last flight I arrived at Ankara Airport. My brother came to pick me up. We hugged each other for long. And you got younger abi (elderly brother in Turkish). Next Article Easter Island or Rapa Nui. The name Rapa Nui is my favorite. Let’s call it as my Rapa Nui Journey.